It’s been a while since the last time the Philippine cinema featured something about the Christian faith. Thus, Lebtelon Film Production Services brings good news through the movie “Diyos-Diyosan”. Not only that, this remarkable film is also timely enough as it tackles a number of socio-political issues that apparently reflect the current situation of the nation today. That’s why this movie is something worth watching as the National Election Day draws near. It is highly expected to be the movie of the year where everyone could learn a lot from. 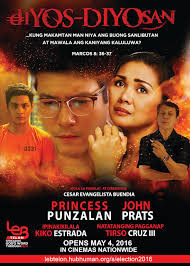 What makes “Diyos-Diyosan” even more exciting is the fact that is stars one of the country’s most well-appreciated antagonists in films and TV drama series, Ms. Princess Punzalan. But this time, she’s playing the role that Filipinos are surely not used to see her do. In fact, her character as Estrell in the movie is one who had a renewed heart and made a decision to live the rest of her life as a true follower of Jesus Christ. She’s the former teacher of Bernard, played by John Prats, who considers himself a self-made man after experiencing a tragic life from the hands of his own parents then. Basically, the story’s plot would tackle Bernard’s quest for success and power as an aspirant for presidency, and the possibility that he would eventually be saved and turn to God with the help of his mother. Overall, one could make some realizations upon watching “Diyos-Diyosan”. Everyone should get to reflect through this movie as it has something to say about the things that make a person submit to his ‘diyos-diyosan’ or functional savior. This movie is directed by Cesar Buendia and it will be shown in theaters nationwide on May 4, 2016. Other actors featured in this socio-political/spiritual film include Glaiza de Castro, Kiko Estrada, Lorenzo Mara, Cheska Diaz, Vaness del Moral, and with the special participation of premier actor, Tirso Cruz III.